Uploaded 10/19/2014 Film / Memory Type . Wonderful composition and pet portrait.. nessa..congrats on award. These cat eyes are breathtaking Srna,Is that yours?congratulations on the well deserved award my dear!!!! :-).. lovely capture my dear friend. great capture my dear Srna!!!! congratulations on the well deservd award!!!! agree and agree,. congratulations on the bip srna,. regards art,. Thank you, Clay. his eyes are slightly in different colors and I do not know if that is common in Siamese cats, sorry. Thank you so much, Paul. They do make great photographic studies all the time and I enjoy shooting them too. Thank you so much, Jill. Glad this photo brought some happy memories from your childhood. Thank you so much, art. Your comprehensive comment is much appreciated. Nice capture Srna. First thing I noticed were that the eyes were different color. I wonder if that is common in Siamese cats. They do make great photographic studies don't they! You captured his personality very well. Love the eyes. Congrats for cat and award. Great shot Srna!very well done! 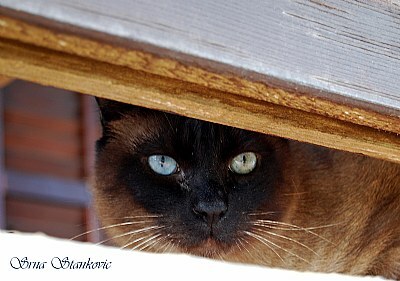 Very nice capture of this beautiful Siamese,brings back some happy memories of cats I had in my childhood. Thank you for sharing. Very nicely captured moment with this beauty. ps,. thanks for camera data,. art,. great capture, you cought what ever it was that got her attention in the eyes, about to go in stalk mode, love the odd coloured eyes,. excellent light considering the cat is under cover,. regards art,.